Protesters gathered outside the courthouse Tuesday. 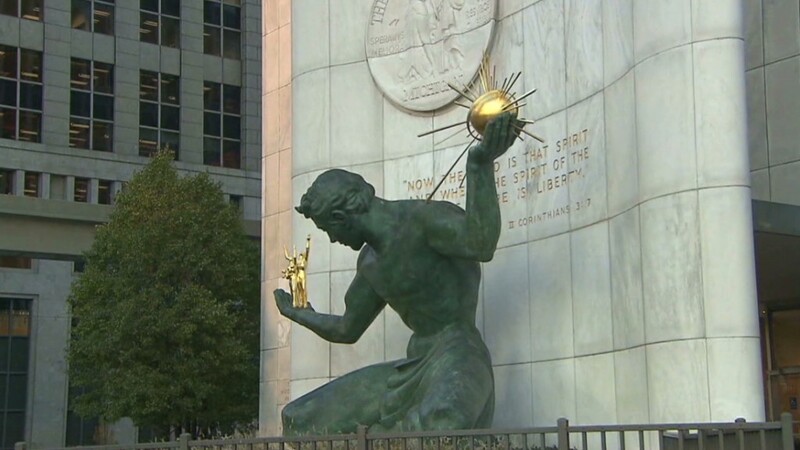 A federal judge has given a green light for Detroit to proceed with its bankruptcy, the largest municipal bankruptcy in history. Unions and pension funds had argued that the city should not be eligible to use bankruptcy court protections. They said that regardless of the Detroit's financial troubles, city and state officials did not negotiate with creditors in good faith in an effort to reach a deal on its liabilities. One major union, the American Federation of State, County & Municipal Employees, has already said it plans to appeal the decision. Related: Just how generous are Detroit's pensions? Detroit filed for bankruptcy court protection on July 18. Once one of the nation's largest cities, Detroit was a symbol of U.S. manufacturing might. But decades of declining population and the departure of businesses have left it struggling with high crime, high taxes and poor city services. Emergency Manager Kevyn Orr, who was appointed by Michigan Gov. Rick Snyder in March to oversee the city's finances, has proposed slashing more than $9 billion of $11.5 billion in unsecured debt. But Orr's plan could mean deep cuts to the pension benefits and retiree health coverage that has been promised to city employees. It could also mean investors holding debt issued by Detroit would receive only pennies on the dollar. Opponents have argued that pension cuts are barred by the state's constitution. But Judge Rhodes ruled that pensions are fair game under federal bankruptcy law, trumping state law, though he noted that didn't mean he would definitely approve cuts. "He isn't going to do it lightly, and he recognizes the significance of these issues, but pension cuts are certainly on the table," said attorney Michael Sweet, an expert in municipal bankruptcy, who listened in on Tuesday's ruling. No municipal bankruptcy has ever resulted in involuntary cuts to pension benefits, Sweet said. In California, Vallejo exited bankruptcy in 2011 without imposing cuts to its ballooning pension obligations, while nearby Stockton plans to do the same. 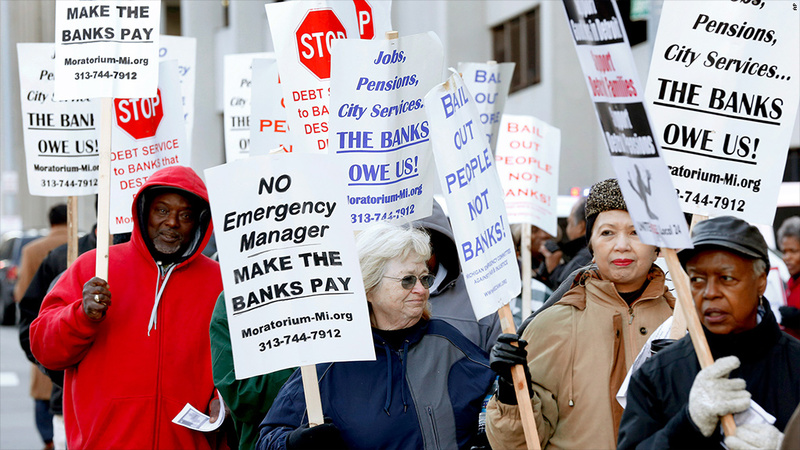 It's unclear just how deep pension cuts could be in Detroit. But Orr can now prepare a proposal for the court on how the city will slash its debt, said attorney Michael Sweet, an expert in municipal bankruptcy. The judge will have to sign off on the plan. Sweet said that Rhodes urged the parties to move quickly, though creditors may seek to delay proceedings during the appeals process. "The big question looming out there is, 'Will the appeals slow the process down?'" Sweet said. Meanwhile, Orr said in a press call with reporters that the city would continue to negotiate with its many creditors as it crafts its bankruptcy plan. "We continue to try to work with both our unions and our creditors to reach consensual resolutions," he said. Retired Detroit fire captain Arthur Versace, 62, began applying for full-time jobs at Home Depot and Costco after Detroit's bankruptcy filing this summer. Unable to find work, Versace said he isn't sure if he and his wife will be able to meet their monthly expenses, which include a mortgage payment, if his pension is cut. After taxes and his health care premium, he receives around $45,000 a year. And like many other public safety workers, he is not eligible for Social Security. "I'm worried about how I'm going to pay my bills. How do I pay for my car insurance, my house insurance, my house taxes?" Versace said. "People don't want to hire someone that's 62 years old, they just don't."